Learning from Life: What is it exactly, that STAY HOME MOMS do? When I watched this video, it made me remember a lot of the feelings I had as a Stay At Home Mom. Even that many years ago, still it was different from what most Mom's were doing. Staying Home as a Mom, is a bit tougher than it looks. It seems like before you wake up, your to do list is miles long. It is planning one thing, but having something else take its place. It was a lot of impromptu experiences, especially with kids. Some days I felt like I had accomplished a lot, but there were many days that I hardly ever got to scratch off something from my To Do List; and even days that I wasn't even a very good Mom. I was impatient and frustrated more than I should have been. My priorities were mixed up usually on those days. Like this video, it was usually something that one of my children did or said...that changed my perspective. 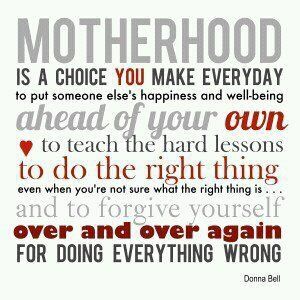 Which gave me hope so that I could get up the next day and be a Better Mom! Motherhood is hard, there is not two ways about it. Motherhood is a gift and one that we need to be thankful each day. Finding balance is the key, appreciating the little things is very helpful and forgiving yourself and trying harder the next day... is truly what a Stay Home Mom is all about. I know, because I was one for almost 30 years!